Znkl - 177 is a simple physical puzzle. The player's goal is to deliver a capsule with information to the spaceship. 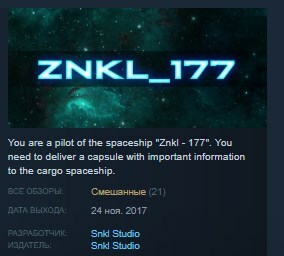 You are a pilot of the spaceship "Znkl - 177". You need to deliver a capsule with important information to the cargo spaceship. Credits: This game was created using Clickteam Fusion 2.5! Music by Neocoda.